Reference lists (or pages) are a list of all of the sources (in APA format) that you used in your assignment. Create your reference page before you start to write your paper! Remember that Citation Generators can help get you started - but are not always accurate! View samples of what APA formatted papers should look like, as well as access videos that demonstrate how to format using Microsoft Word. View this great online resource that describes general formatting rules for APA. Check out these other great APA resources - at the Writing Centre, in the library & on the web. APA 6th edition does not typically include your course name, course code, date, or professor's name on the cover/title page. Cites & Sources recommends that students include this information. Please check with your professor for individual expectations. 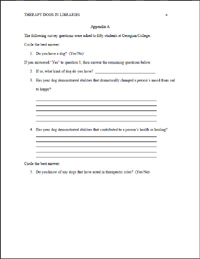 To view a sample coverpage in APA format, click on the image below. The following videos, created by Walden University Academic Skills Center, may be helpful in applying the basic formatting needed for APA style, when using Microsoft Word. 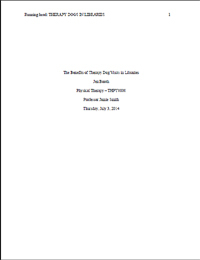 To view a sample of what the body of an APA formatted paper looks like, click on the image below. 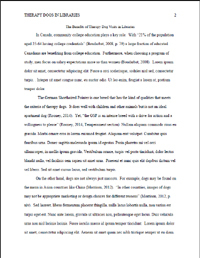 See what the body/text of the paper looks like in APA format. Click on the link to "APA Sample Paper" to see what a complete paper might look like. Includes lots of helpful tips. To view a sample of an APA reference page, click on the image below. View an example of how your final reference page should look. A great primer on how to put your reference page together, from Purdue OWL. To view a sample of an APA appendix page, click on the image below. View this great resource for more information on how to format Appendices in your APA paper.